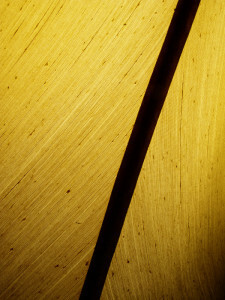 Wonderful examples of light, line, pattern, and design can often be found in very mundane objects. One evening I was walking from the kitchen to the bedroom when, as if seeing it for the first time, one of the lamps in the house really caught my eye. I must have walked past this same lamp a hundred times, if not a thousand or more. The lamps are a nice design in and of themselves. But on this occasion my attention was drawn to the lampshade—to the texture of its cloth-like surface, to the strong, dark, ribbing, and to the quality of its illumination. I stopped in my tracks. Literally. 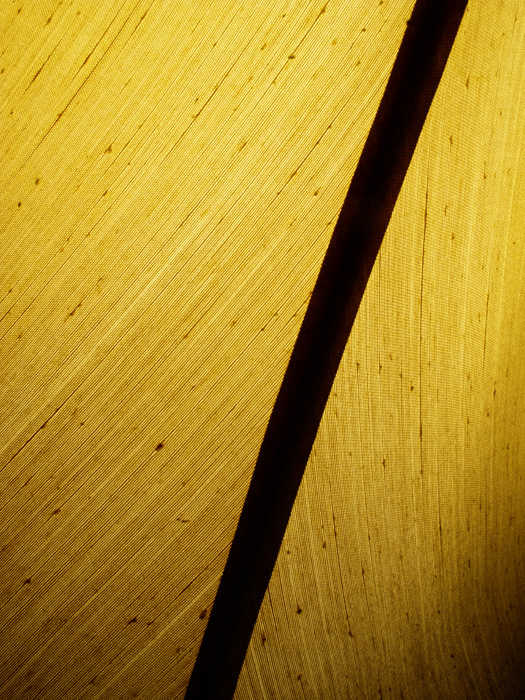 After a closer inspection of the lampshade I decided to get my camera. I must have worked with that lamp for a half hour. It was really a joy to see new lines, to envision an abstract image, in that lamp. I tilted my camera slightly to “see” a single rib as a strong diagonal. Parallel threads arrayed in a herringbone pattern completed the design.